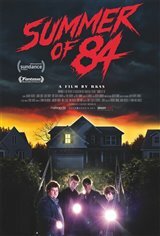 In the summer of 1984, in a quiet suburb of Oregon, a 13th boy goes missing. Davey Armstrong, a teenage conspiracy theorist, suspects his neighbor Wayne Mackey, a single policeman, of being the serial killer. In order to convince his three best friends to join him in the investigation, Davey tells them he noticed a padlocked door in the cop’s basement, and that Mackey has been buying a lot of dirt and digging supplies that could be for body disposal. Armed with walkie talkies, the four kids immediately began to spy on the mysterious neighbor. As the situation becomes perilous, Nikki, Davey's former babysitter on whom they all have a crush, joins them.